Not only was 2005 a good year but I've also given out my share of Blue Moon awards. Those should speak for themselves. So why then am I about to utilize my space here to talk about certain products I haven't even reviewed yet? Well, because it's 2005 and I hope to get at least some of them reviewed before year's end. I think these are products you should know about now. Simpy put, I don't want to wait until the winter of 2006 to recognize them as outstanding. Whenever I look back over a reviewing year, the first products that come to mind are those that offer extraordinary value. I'm talking about products that I can recommend to anybody, particularly those on a budget. 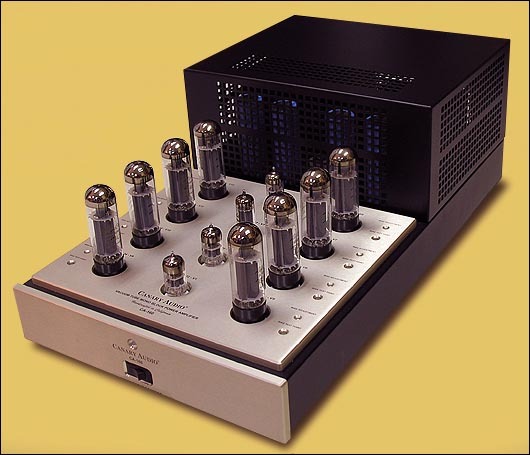 Here the Gallo A'Diva Ti and TR1 sub/sat system is my first recommendation. I bought the review samples and I've recommended them since to family members as well. When it comes to unobtrusiveness, sound and utility, you can't beat them at their price. They make a great music system and are a natural for multichannel systems that won't visually dominate the room. Coherence, speed and clarity are the sonic hallmarks that make the Gallo system an exceptional value and an easy recommendation. 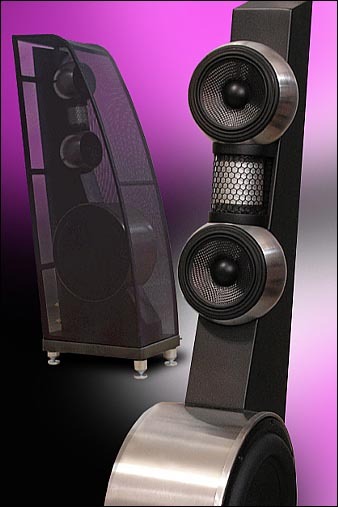 In fact, I was so impressed with these puny Gallos that I just had to hear their bigger siblings called the Reference 3s. Guess what? I bought those, too. I plan on a full review in due time but for now, let me list just a few of the reasons why they appeal to me. First, they are small. Though exceptionally sturdy, they are light. I can move them around easily. Second, due to the fact that they don't utilize rear-firing ports or drivers, they are remarkably easy to position within the room. Unfussy is good. Third, like their smaller siblings, they absolutely disappear into the room and throw a soundstage that is in complete contrast to their small size. Fourth, the speakers sound spectacular. Score another easy recommendation for Anthony Gallo. My third recommendation is of yet another tiny speaker. 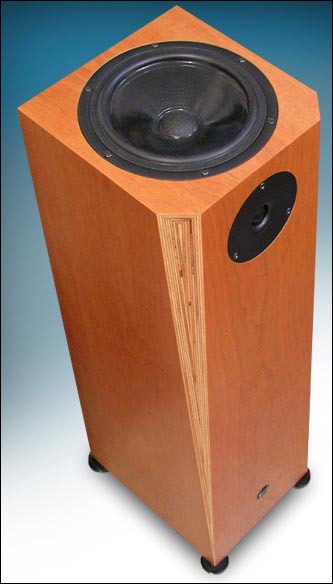 In fact, at 28 inches tall, the FJ Om makes the Reference 3 look large by comparison. Imported from Germany, it does suffer a bit in the area of price next to the 25% less expensive Gallos. But at $4,000/pr, it's not exorbitant neither by today's standards nor considering the standard of musicality it sets. Like the Gallo, the FJ completely disappears into the room and sounds much bigger in terms of bass extension and sound field than one would think to look at it. However, it's voiced much differently than the Gallos. Warmer overall, the FJ doesn't have the treble extension of the Gallos and it's not quite as airy or detailed through the highs. But it's unusually musical and extremely expressive. It's also unusually room-friendly. It sounds great with any kind of music and is wonderfully kind to all kinds of recordings. 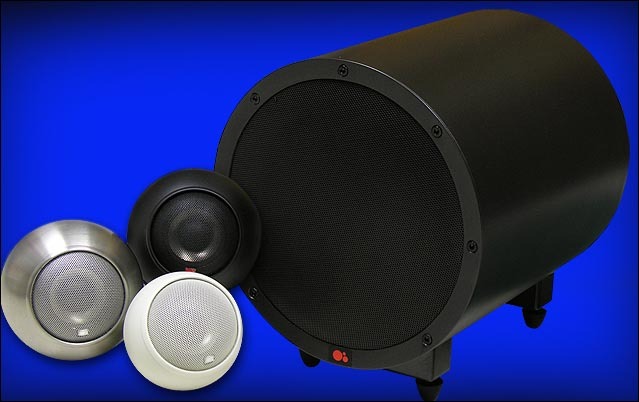 In short, this is one user-friendly speaker. Review yet to come but already highly recommended. My next recommendation came as the greatest personal surprise of the year. I've tried several different types of cones over the years and written them off as not being for me. But when approached by the Lotus Group to try the very different products from Sound Mechanics, I was curious. 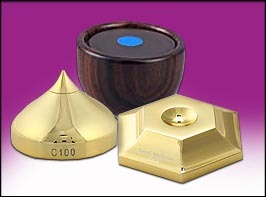 Unlike those cones of the past, the MC88 footers and C100 cones are more about resonance tuning than coupling or decoupling. The MC88 is made from wood and the C100s are metal. Both are said to be filled with 10 types of metallic sands. Not only that, each piece in the set of three seems to be filled with a different mix (you can see the difference through a clear window). That gives each footer a different resonant frequency/signature. The MC88 doesn't sound like the C100 as you would expect. Neither do they effect all components in the same way. These are tuning devices after all. Some experimentation is mandatory. However, their easily demonstrable effect means that evaluating their performance with a component is easier than you would think. Tuning an entire system can be accomplished in an afternoon or two. After a little experimentation, I achieved a level of bass body and definition, soundstage coherence and overall focus that left me flabbergasted. Clearly Sound Mechanics is on to something and I can't recommend these devices more highly.